FAQ / Why aren’t my payment buttons displaying on the checkout page? Why aren’t my payment buttons displaying on the checkout page? Are your payment gateways setup? You can follow along with our How To videos in order to get your Stripe and / or PayPal payment gateway setup. If you have already done this, you can skip this step. In your WordPress dashboard, go to the WP Videos -> Memberships page, where you can create and view your membership plans. Under each membership that you've created, there should be either a Stripe, PayPal, or both gateway section. See image below. Notice how in the Day Plan both Stripe and PayPal are green with an Active label next to them. This indicates that the Day Plan membership plan has been created on those payment gateways. 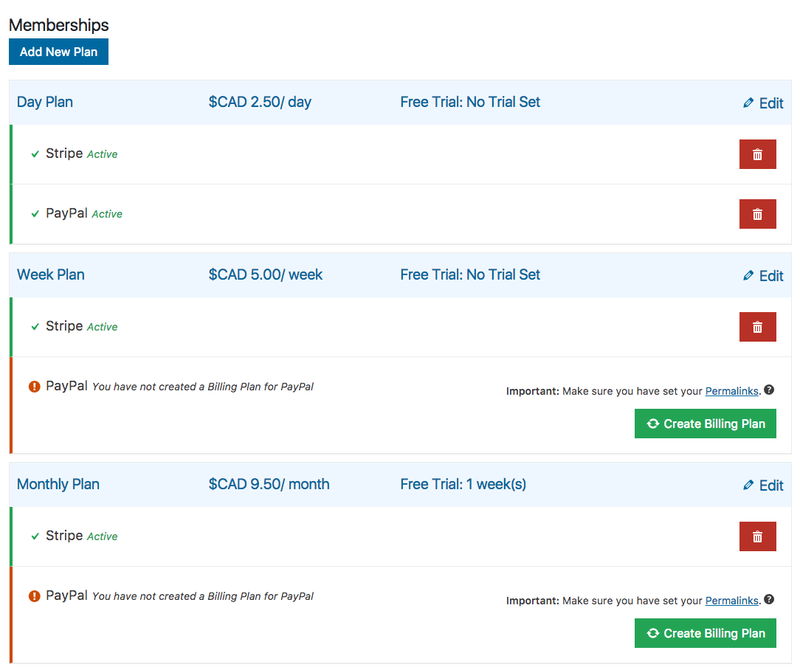 "You have not created a Billing Plan for PayPal"
You need to click the green Create Billing Plan button on the right side in order to create the membership plan (Billing Plan) for PayPal. You need to make sure that each payment gateway that you are using has an active state under each membership. Otherwise, the payment button for that gateway will not show up on the checkout page for that membership.